Growing up, Joliet native John Lausch says he didn’t go to baseball games, and that’s how he became a Cubs fan. Lausch went on to lead his Joliet Catholic high school team to become state football champions, and became a linebacker for Harvard’s team before graduating from law school at Northwestern and, eventually, working as an assistant U.S. attorney. The hometown boy has now risen to one of the highest levels of his profession. In January, Sessions announced the Justice Department would no longer follow the Obama-era “hands-off” approach of interfering with states that have broken from federal law and legalized the drug; Sessions didn’t direct prosecutions, but he unleashed federal prosecutors to crack down on pot as they wish. Illinois has not legalized recreational marijuana, though lawmakers have held hearings in recent months as they work to secure support. But possessing small amounts of pot will earn someone a citation and fine instead of jail time, and Illinois has a highly regulated medical marijuana program. Laush says instead, he’ll focus first and foremost on national security, as well as violent crime. Government corruption will be another priority – it’s Chicago after all – but he gave no insight as to public corruption cases the office may currently be pursuing, including as to whether there’s any investigation into how portions of FBI wiretapped tapes of former Gov. Rod Blagojevich that should have remained secret, instead became public, such as portions of the conversations between Blagojevich and current Democratic candidate for governor J.B. Pritzker that are now being aired by Gov. Bruce Rauner as he campaigns for a second term. “Certain tapes are available to the public because they were used in evidence at trial. For tapes that were not used as evidence at trial, and not publicly available, that is a concern. Yes,” he said. Lausch says his office currently has between 150-160 assistant U.S. attorneys, and is working to fill nine spots – three of which are in the violent crimes unit. He couldn’t, however, offer a reason as to why violent crime and public corruption are bigger problems in Northern Illinois than in other major cities. As for attacks on the FBI and the justice system voiced by Trump and other high-level officials, Lausch says he won’t comment on politics of politicians’ rhetoric. Sorry, fans of “The Good Wife” – a drama about Chicago politics and prosecutors – Lausch says he didn’t watch the show. Who is US Attorney Nominee John Lausch? Aug. 9: Former U.S. attorneys weigh in on the new nominee for the Northern District of Illinois, John Lausch. 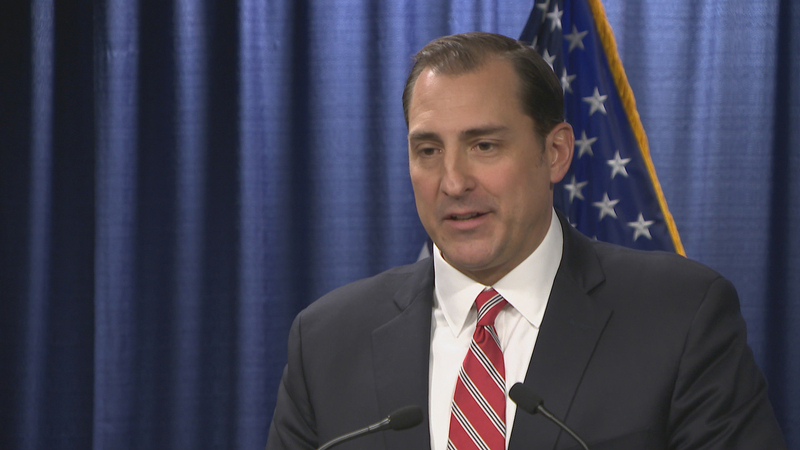 June 30: President Donald Trump has selected former federal prosecutor John Lausch to be the next U.S. attorney for the Northern District of Illinois, according to multiple reports Friday. June 30: Recently departed U.S. Attorney Zachary Fardon, who brought down former House Speaker Dennis Hastert and CPS chief Barbara Byrd-Bennett, joins us for an exclusive interview.